The EYAL Stationary Electronic Reader for Azides is a versatile reader for the QuantTab™ Azide Determination Card. 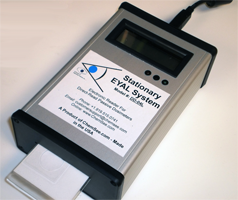 The use of the EYAL System allows for quantitative measurements to be determined. The EYAL™ DD-04L-AZ Reader allows for fast, quantitative determination of Azides in a solution using the QuantTab™ Azide Determination Card. Using the provided software, sample concentrations can be tracked and monitored over time. Small Lightweight Electronic Reader for the QuantTab™ Quantitative Determination Card for Azides in the range of 0 – 250 ppm in neutral pH conditions. Sample preparation pouches for alkaline samples are avaliable upon request. After the user places the suspect sample onto the Sample Port, the user will insert the card into the EYAL Reader. The reader then analyzes the difference in color between the sample and control portions of the detector and calculates quantitative reading of the Azide. Detects concentrations of 10 ppm or greater. 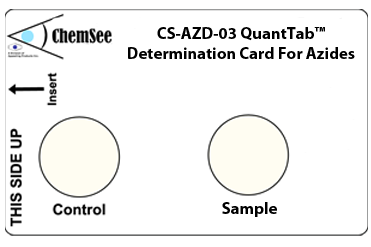 The user can obtain a semi-quantitative assessment of the concentration by using a visual color comparison with the printed color chart on the card. Exact quantitative assessment of the concentration can be done using the EYAL™ DD-04L-AZ Quantitative Reader. Please request a quote for pricing information. The EYAL™ DD-04L-AZ Reader allows for fast, quantitative determination of Azides in a solution using the QuantTab™ Azide Determination Card. Determination in the range of 0 – 250 ppm Azides can be conducted. The provided software outputs, stores, and logs all data on a nearby computer. ChemSee also offers the AZD-NEUT Neutralization Pouch which will bring alkaline samples into the proper detection range for the QuantTab™ Detection Tabs. These sample preparation pouches are low cost and simple to use. Each pouch can be used to treat one sample and is approximately $4. ChemSee will provide a custom quote to address your specific monitoring needs, please Request a Quote and our representatives will contact you shortly.